This graphic compares growth in explicit anti-poverty spending in the United States to progress in actually reducing poverty. The lesson here is clear –just because a government spends more in a particular area is no guarantee that it will make progress towards stated objectives. Policymakers need to keep asking themselves not only whether a priority is worth pursuing (poverty reduction is), but whether the strategies currently being employed are actually working. More spending does not necessarily guarantee better results. 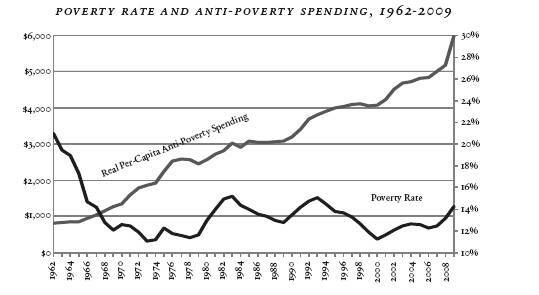 To be clear, I don’t mean to suggest that explicit anti-poverty spending is futile or that the USA should start doing less of it – just that they may not be spending what they do spend as effectively as we would like.